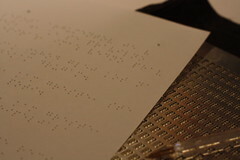 Learning Braille, a photo by Cobra_11 on Flickr. 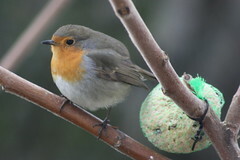 On A Lunchbreak..., a photo by Cobra_11 on Flickr. Mission: Duct Tape, or, How To Get Rid Of Funny Or Poisonous Smells Coming From Your Neighbours' Apartments, a photo by Cobra_11 on Flickr. First of all, let me explain that these photos were made and put together as an instruction, so this is not meant to be artistic. 1) Where does the stench come from? 2) How to seal the stench-outlets? 1) Get some strong transparent duct tape. DO NOT USE PACKAGING TAPE - that one is usually cellophane, which does not seal properly. The tape has to be plastic. In my case I used a 3M tape, which is quite thick and has a very stron sticky side. THe duct tape MUST be at least 5 cm / 2.5 inches wide. 2) Get the tools. You will need a pair of scissors and an old ruler. 3) Prepare the material. Cut the tape into strips that are at least 2.5 cm / 1 inch longer that your electrical outlet. 4) Start sticking. Half of the strip must cover the outlet and the other half of the strip will come on the wall. 5) Always stick the strip of duct tape on the outlet first. Then, take the ruler and pres the duct tape along the edges of the outlet. Then just press the tape onto the wall. Do this one strip at a time, edge for edge. 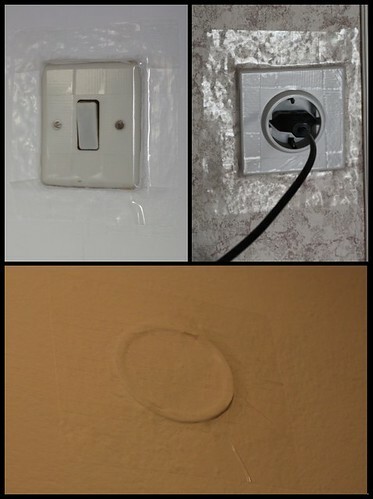 6) Use your fingers and press all the duct tape neatly on the outlet and on the wall. There must be no creases, cracks or air bubbles in the tape for the seal to work. 7) If your electrical switches have bolts in them (as you can see here on the photo - top left corner), be sure to cover them completely with duct tape. 8) Go around the apartment and do this with all the electrical outlets, the switches, and wire crossings. 9) Check the electrical outlets for use. Do you use all of them? The outlets that you do not use should be additionally sealed. You can do that by "child-proofing" the outlets: plug in those safety-plug caps. They are cheap, but they will block the holes in the outlets and the stench will not come out. 10) BE CAREFUL NOT TO TOUCH THE ELECTRICAL OUTLETS! DO NOT PUSH THE DUCT TAPE INTO THE ELECTRICAL OUTLET! DO NOT TAPE AROUND WIRES INSIDE THE WALL! ALL OF THESE THINGS COULD RESULT IN INJURY OR CAUSE FIRE! ALWAYS DO THIS ON THE OUTSIDE OF THE OUTLETS, SWITCHES AND WIRE CROSSINGS ONLY! 11) Think about other outlets of stench, too: lights on the ceiling, the fuse box, etc. Stick duct tape around all of those, too.